Dads are a crazy bunch. From dad jokes to some pretty crazy pranks, they are always willing to teach a lesson to their children or show off their childish sides with complete abandon. A handful of dads have managed to go viral because of the pranks they have played on their children. Whether they’re pranking their kid’s date or attempting to scare the daylights out of their offspring, they always find interesting ways to engage. Here’s a special group of dads who understand what it means to pull off an epic, silly, or just plain strange prank on their children. Scott Mackintosh will be the first dad to admit that he’s “a bit protective” of his four daughters and three sons. The Utah-based father went viral after he wrote a blog post about a prank he pulled on his daughter. During a family outing, he heard his wife telling his daughter to “put on longer shorts,” a request that was met with a resounding “no” from his daughter. 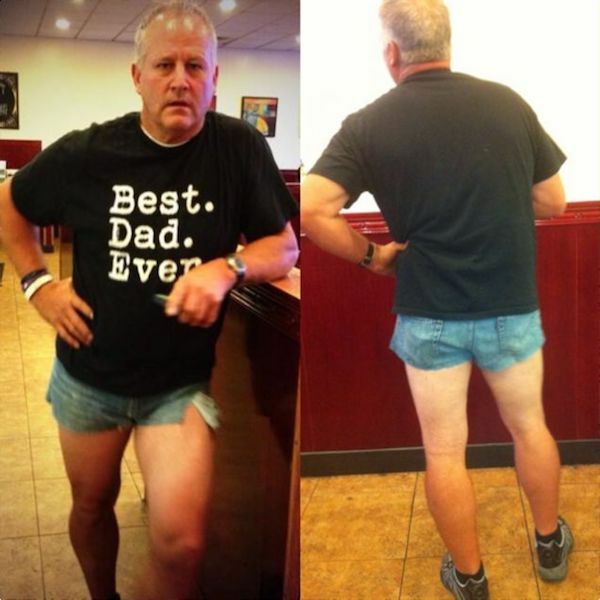 Instead of getting involved in the argument, he decided to put on a pair of tiny shorts and go out with his family. After making a few trips to different locations he says his daughter “now dresses a little better.” This is something you can never unsee after you look at it.